MaryJane Butters (born Mary Jane) was once a single mother of two and a forest ranger, among other tough jobs. She is now an organic farmer, a grandmother and an activist, living on a farm in Northern Idaho. She is also a lifestyle brand, with a line of products (like organic sheets and aprons), a magazine called MaryJane’s Farm (she sends back issues tied adorably in twine), a “farmgirl” chat room, two Web sites (maryjanesfarm.org and maryjanesoutpost.org), a farm bed and breakfast in Moscow, Idaho, and book deal with Clarkson Potter reported to be worth $1.35 million. 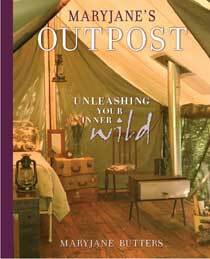 “MaryJane’s Outpost: Unleashing Your Inner Wild” ($30) is her third book, and it’s a dilly. It lures readers outdoors with its Ralph Lauren styling (Ms. Butters’s long blond braid and handsome weathered face are complemented by an atmospheric tractor) and instructions on how to do all sorts of things, like make willow furniture and build an outdoor bed or bathtub. Ms. Butters has a way with words: Glamping, or glamour camping, one of her pet concepts, is about “the juxtaposition of rugged and really pretty, grit and glam, diesel and absolutely darling,” she writes. Her own truck, which runs on biodiesel, she explains, is painted pink to match her fingernail polish. For urbanites, there are instructions on container gardens, including how to plant succulents in old cowboy boots.